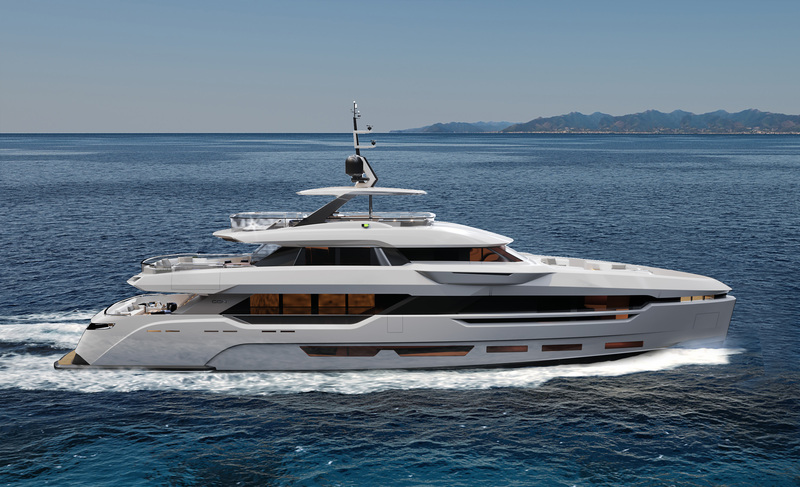 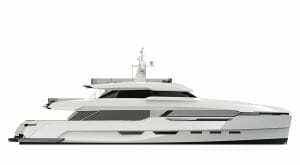 First of a new line of boats called “DOM” (from latin “Domus”, “home”), this 37 meter, designed by Stefano Vafiadis is born to cruise both with comfort and style. 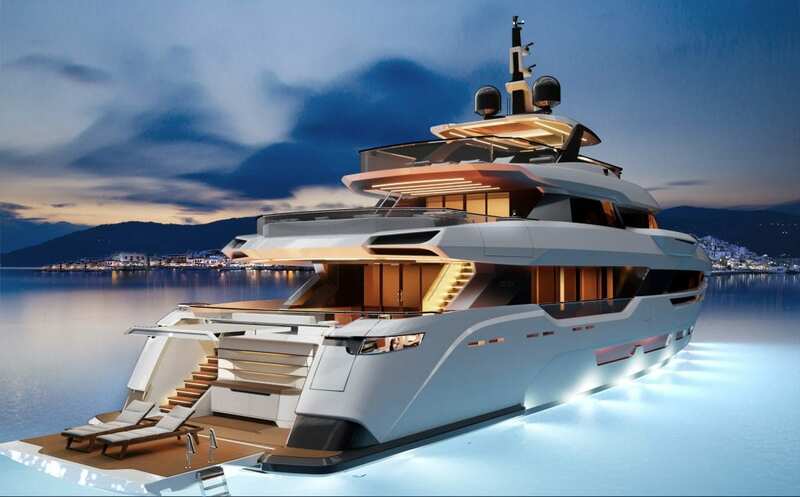 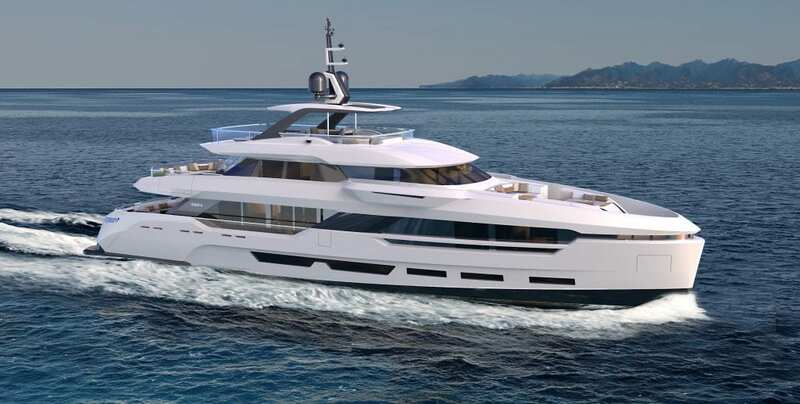 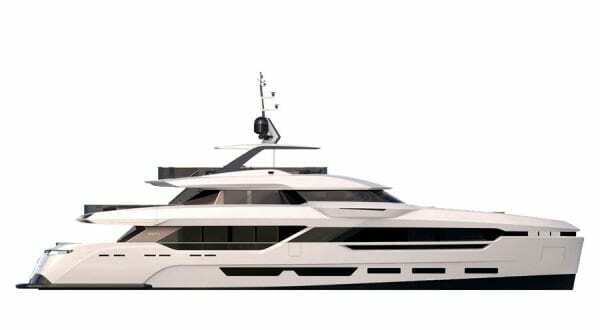 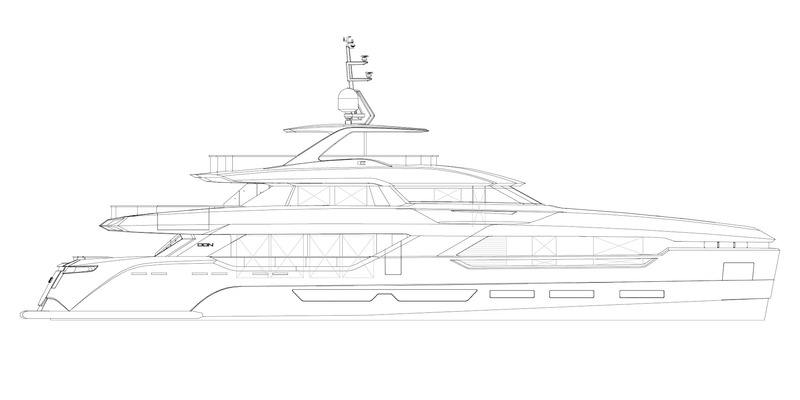 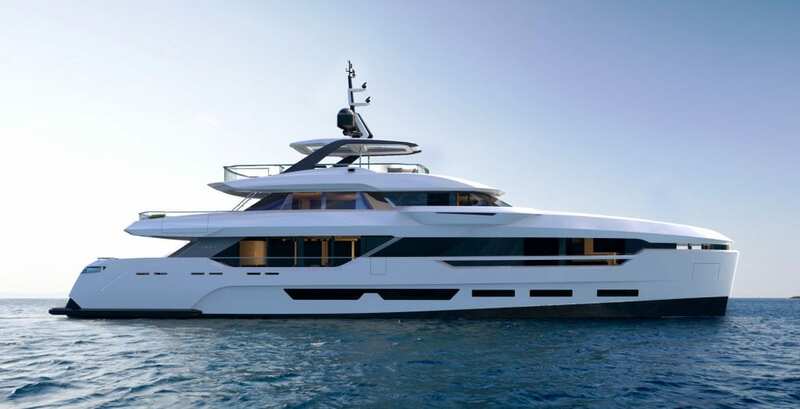 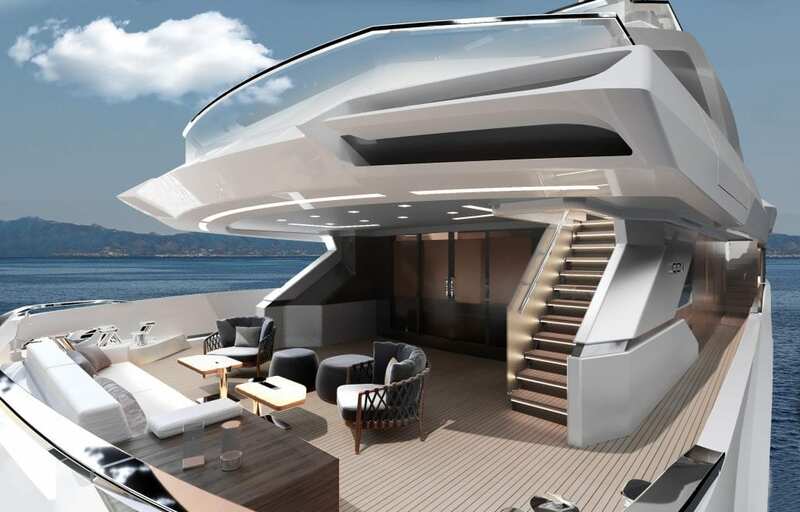 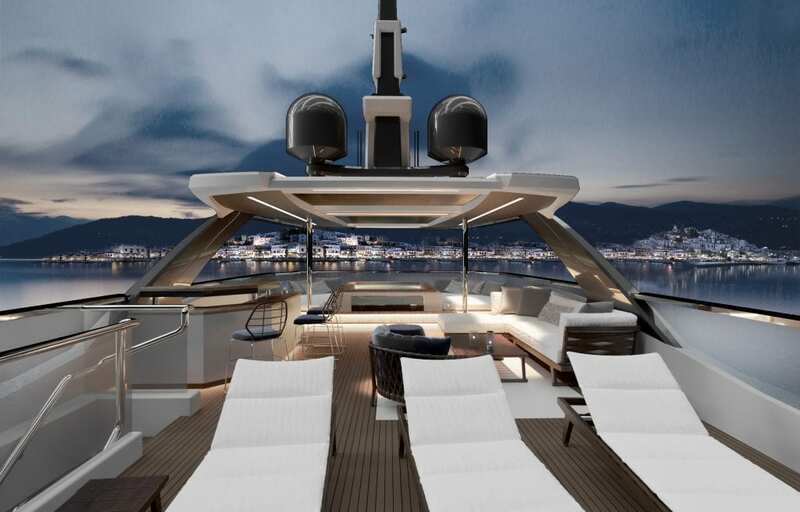 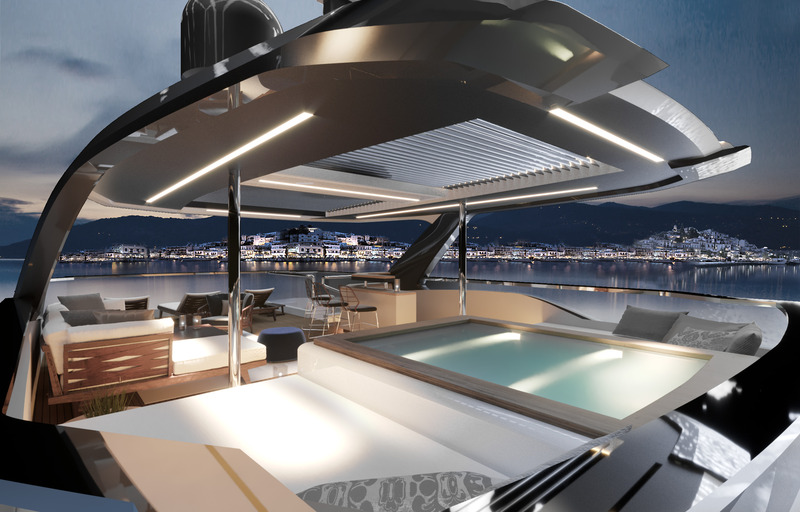 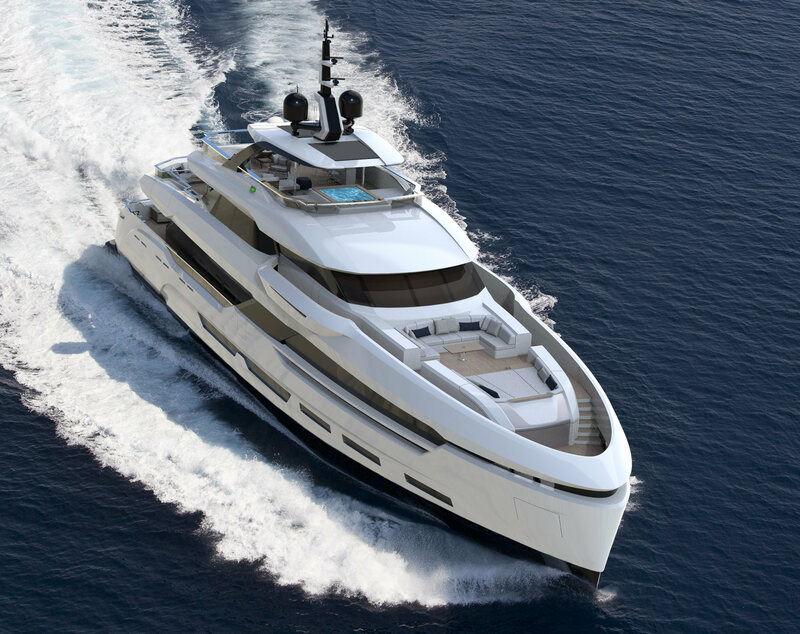 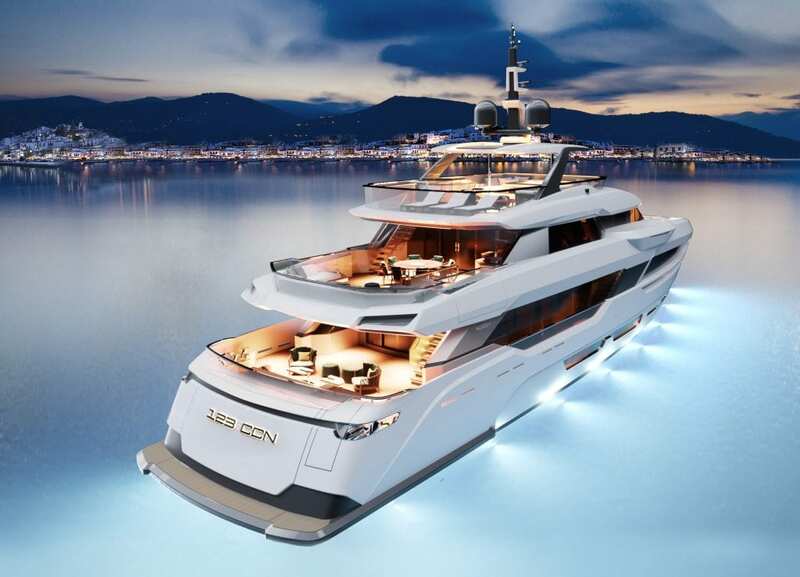 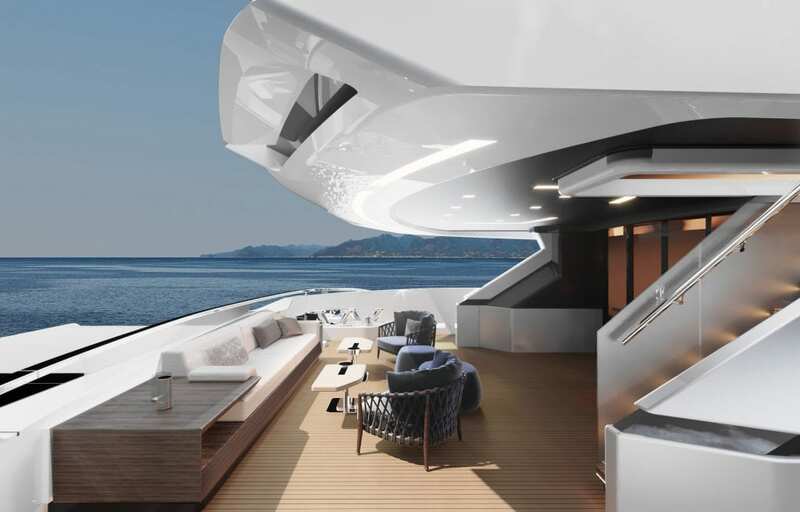 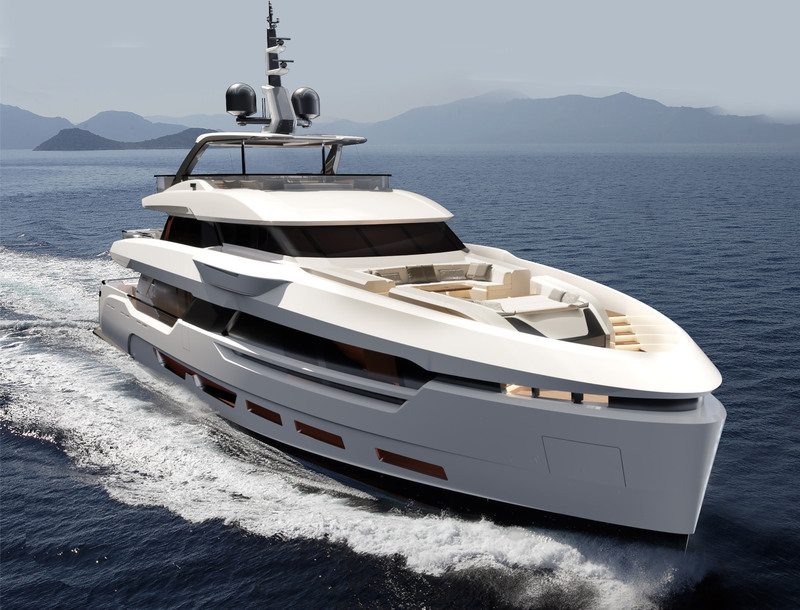 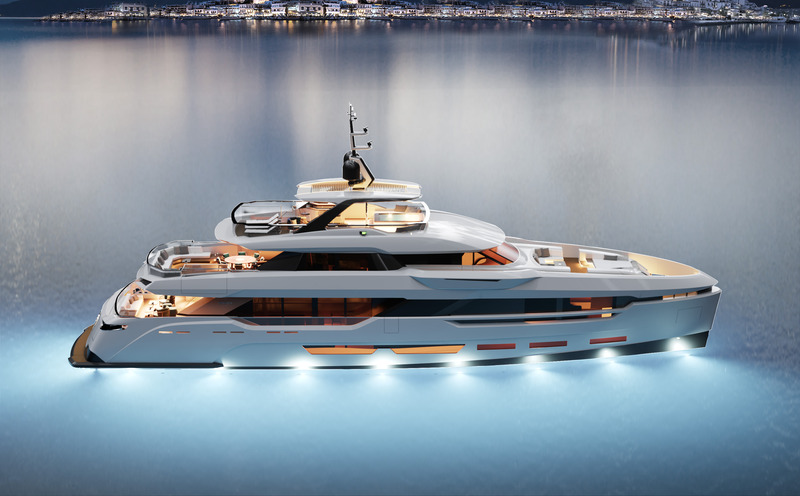 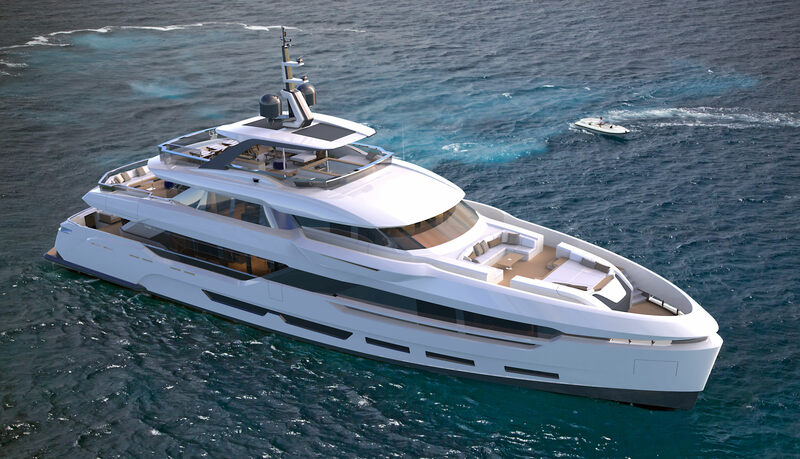 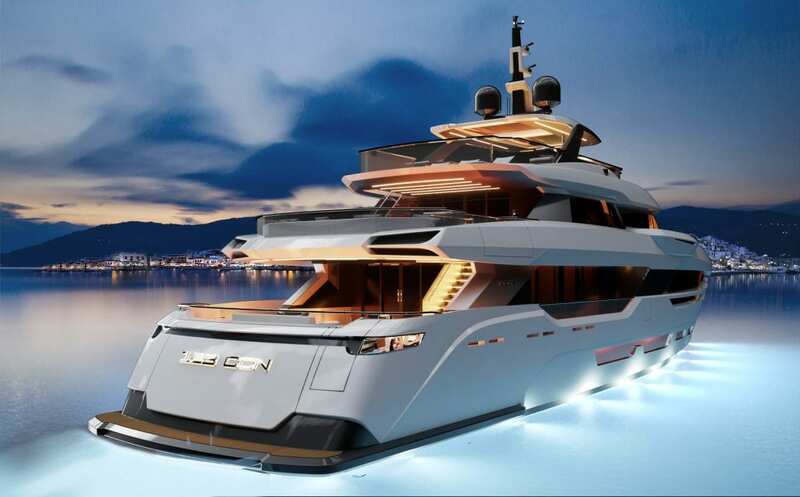 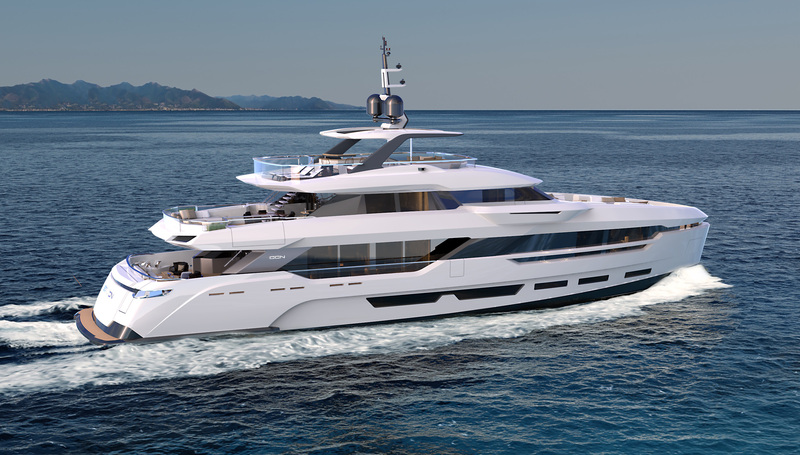 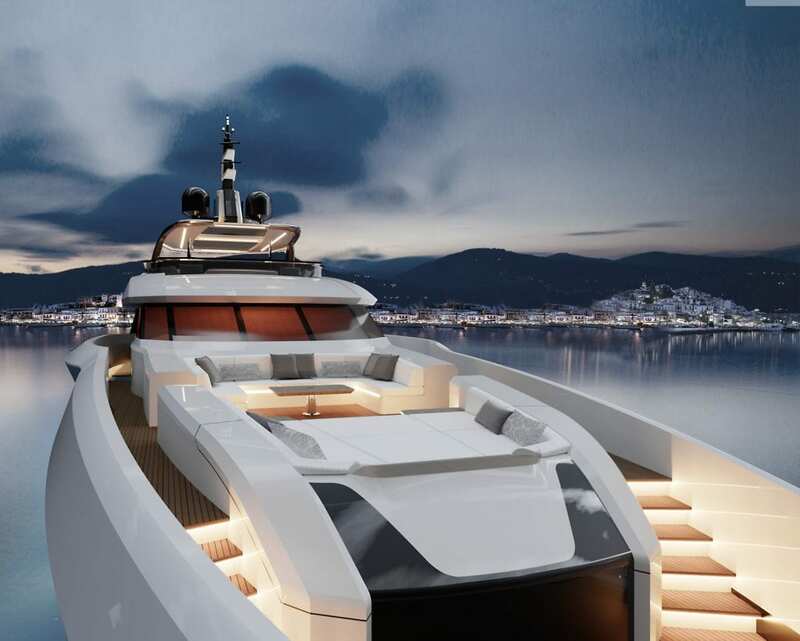 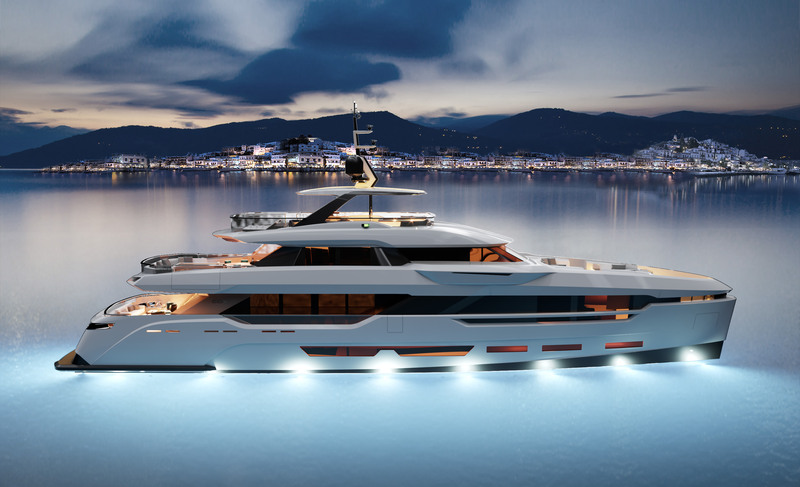 The design was driven by the desires and needs of a modern and young yacht owner, thinking also about lifestyle and functionality.The Dom123 is characterized by an aluminum semi-displacement hull and can reach a maximum speed of 21 knots and a cruising speed of 18 knots thanks to twin MTU 16V2000M96L engines producing 2600 HP each. 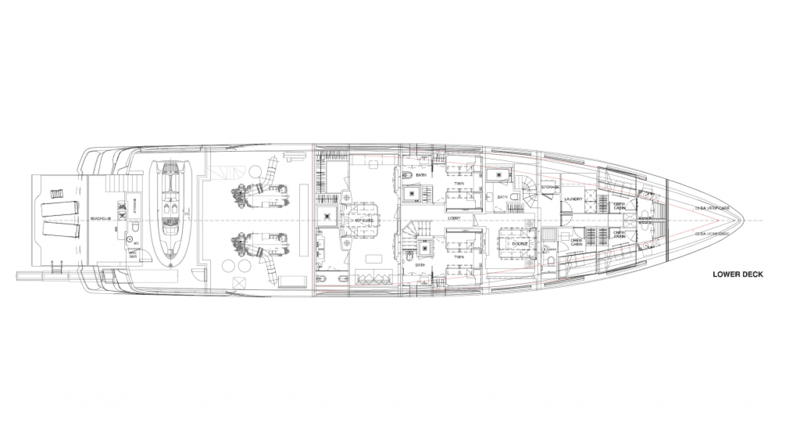 The hull, tested at the Brodarsky Institute of Zagreb, presents a forward bulb designed to optimize the performance of navigability and efficiency at an economical cruising speed (12kn), ensuring a range of 3,000 nautical miles. 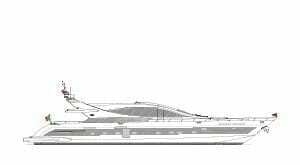 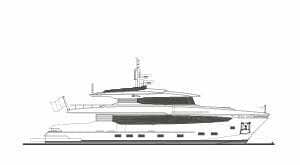 In addition, the chosen beam of 8.70 m allows for a large internal volume, providing at the same time high stability in all sea conditions. 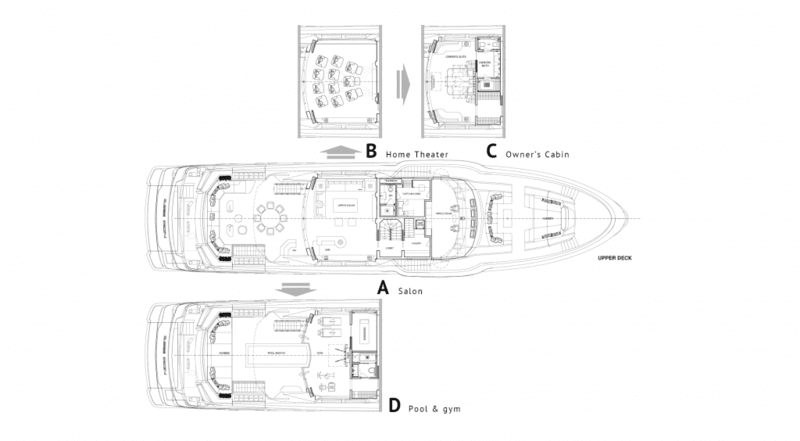 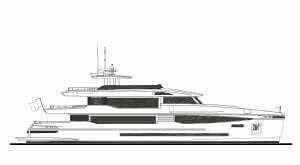 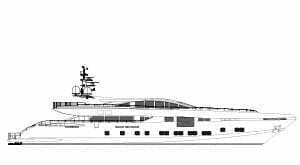 The layout of the vessel can accommodate 4 or 5 cabins in the lower deck. 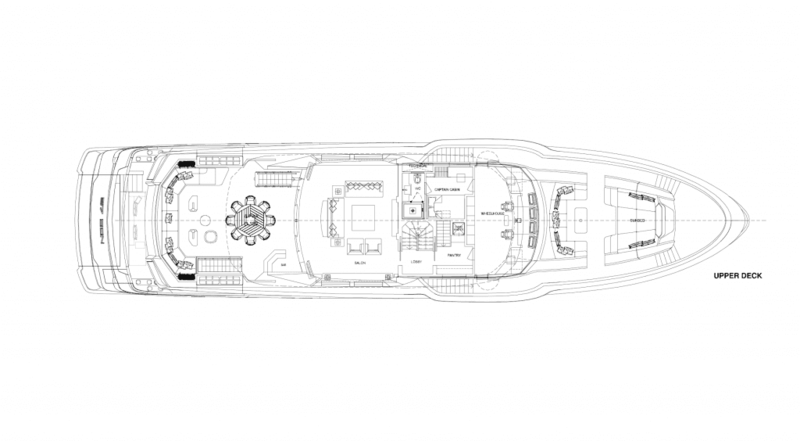 The Main Deck is dedicated to the owner’s cabin only, offering a 10 or 12 guests option. 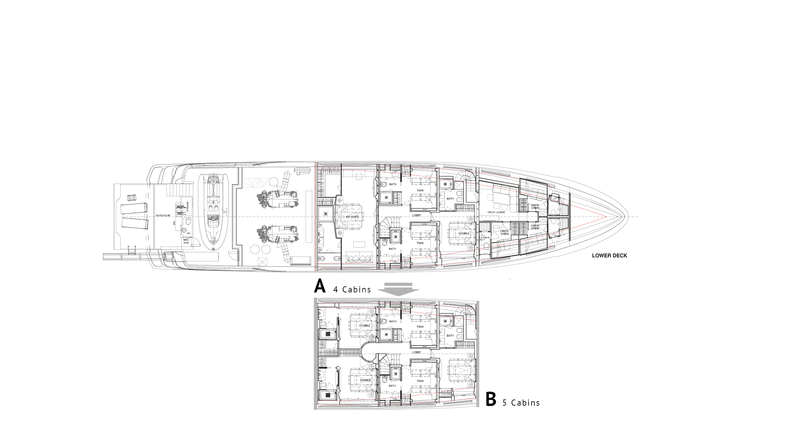 The 4 cabin layout hosts 2 wide body VIP cabins on the aft side and the fore side of the compartment and 2 convertible twins (or doubles) amidship. The Owner’s cabin is on the Main Deck and has 2 wonderful side windows (floor to ceiling) that ensure spectacular sea views and plenty of natural light inside the stateroom. 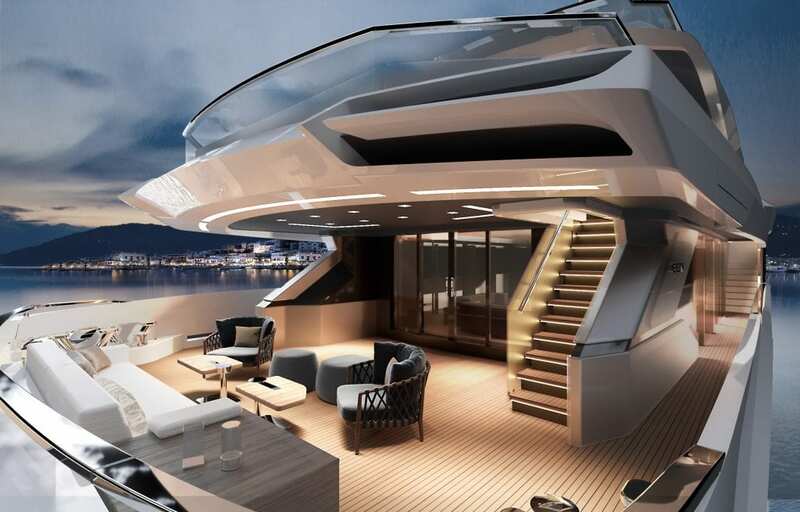 The interior is very spacious as well. 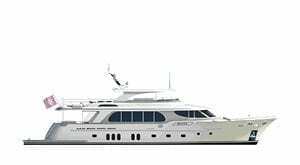 The 2 salons offer a substantial amount of volume: the one on the Main Deck is more formal and hosts a dining room for 10 people, 12 if requested, with a central living room arrangement. 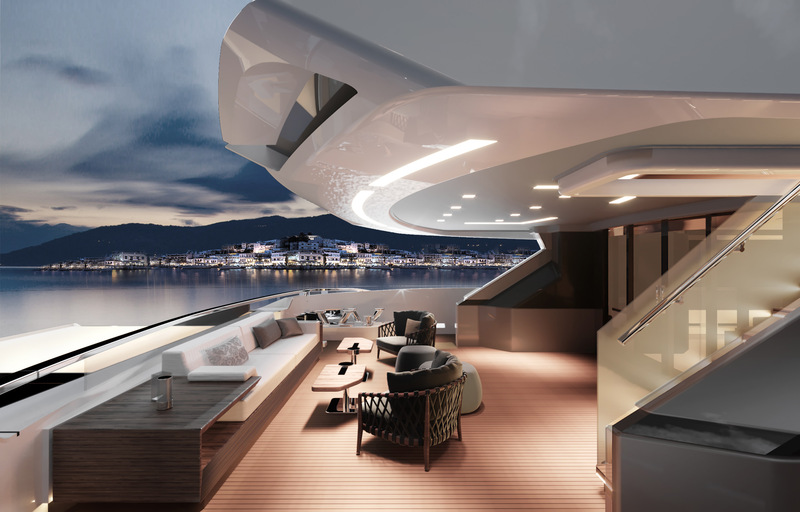 On the Upper Deck we find a SkyLounge that can become a cinema room. 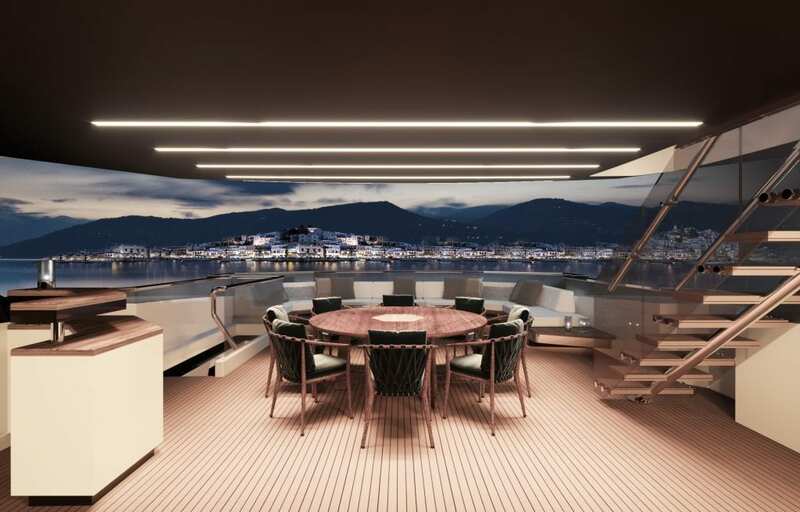 Moving outside through the sliding windows that completely open, there is a spectacular and panoramic external dining area with a round table, always available for 10/12 guests. 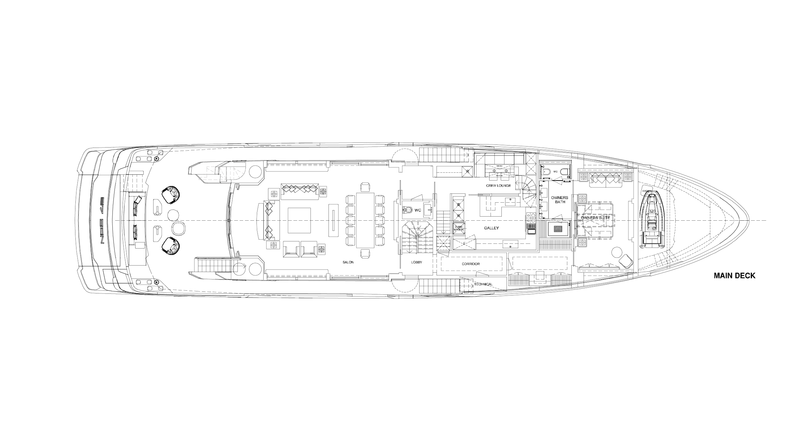 The service is ensured by full size pantries on the Main Deck and Upper Deck, plus a professional Galley on the Main Deck. The Captain’s cabin is on the Upper Deck while the rest of the crew is located on the Lower deck, where there is also a crew mess and a laundry. 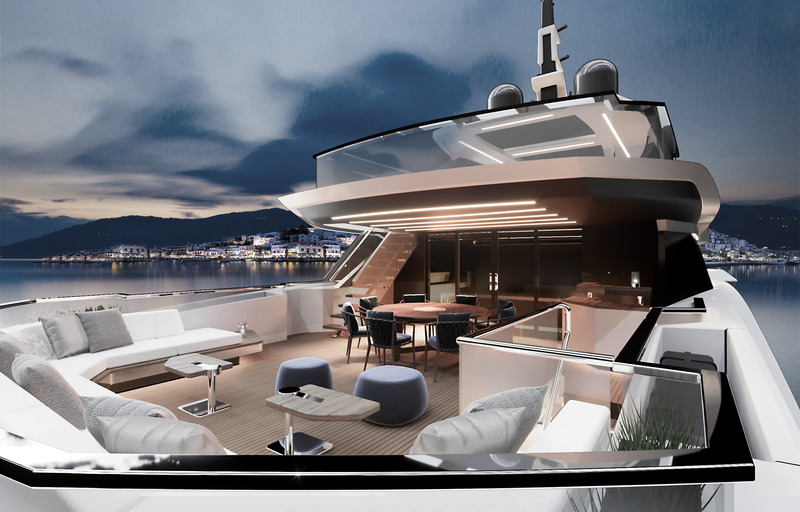 The external spaces are vast and very cozy, designed both for parties or relaxing. 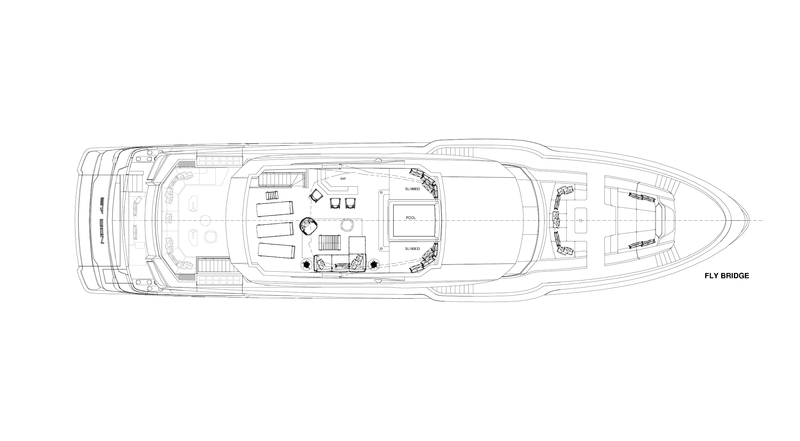 The aft peak on the main deck offers a nice seating area with a large table, ideal for informal dining. 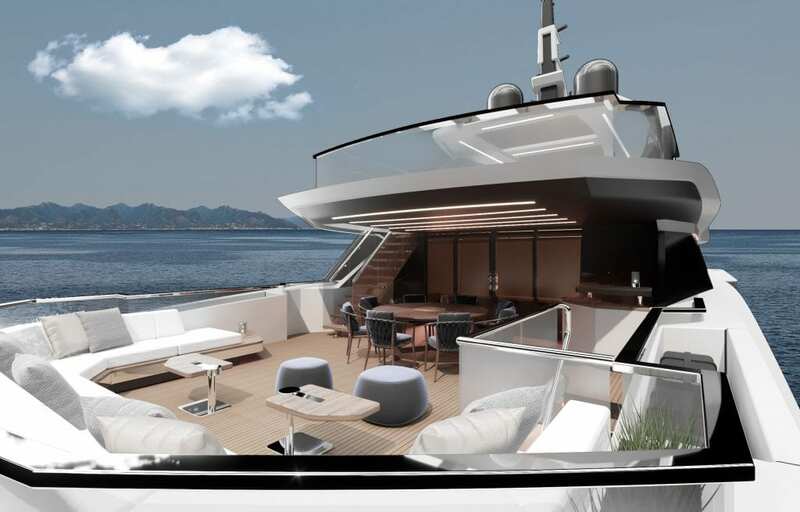 The external dining area is on the upper deck; here you can find a comfortable conversation area with a C – sofa perfect to enjoy the view. 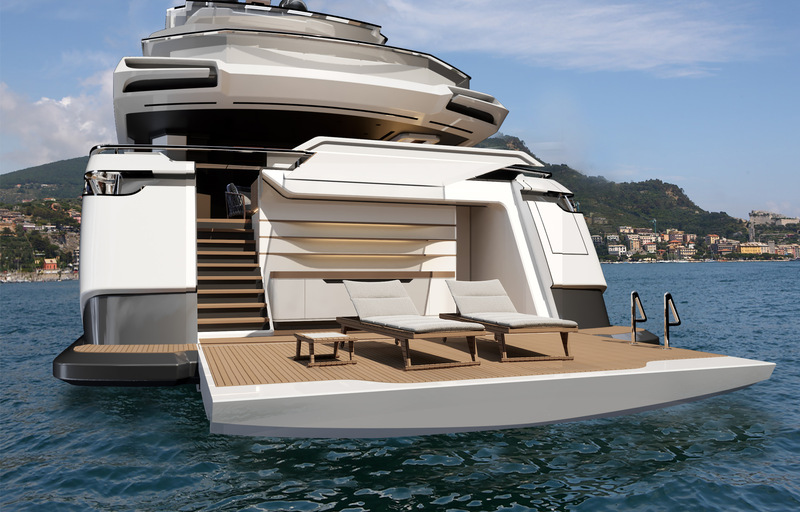 The Flybridge is very large and offers a modern squared Jacuzzi with chromed railings that is served by a central staircase. 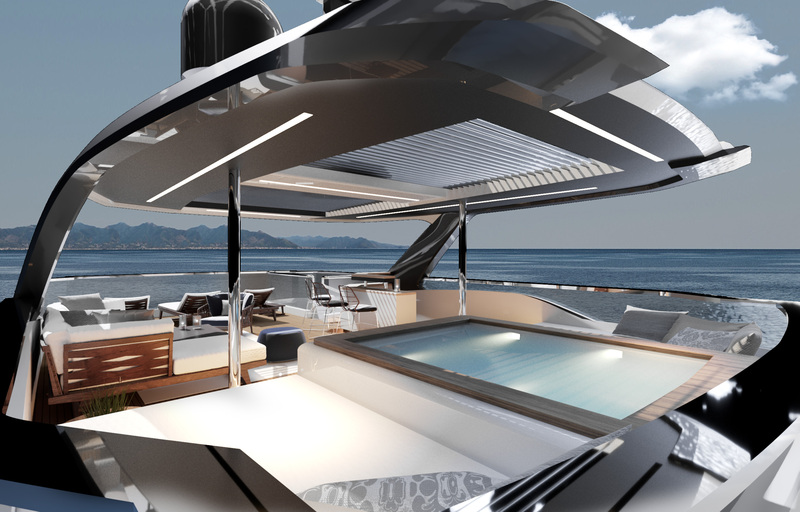 The Tender garage is functional and separated from the Beach Club, which is very spacious and uncompromised. 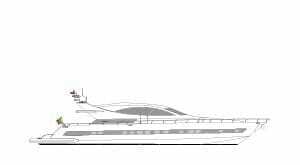 The Beach club has a wide platform that covers the complete height of the stern when closed. 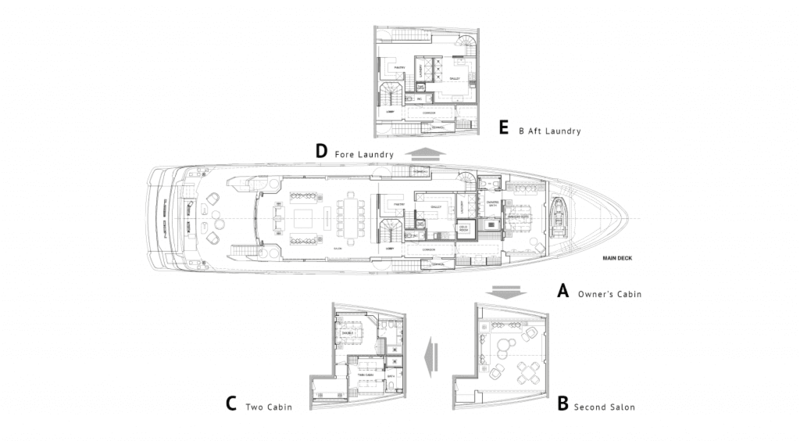 While horizontal, it offers a very large livable area and a nice open space. 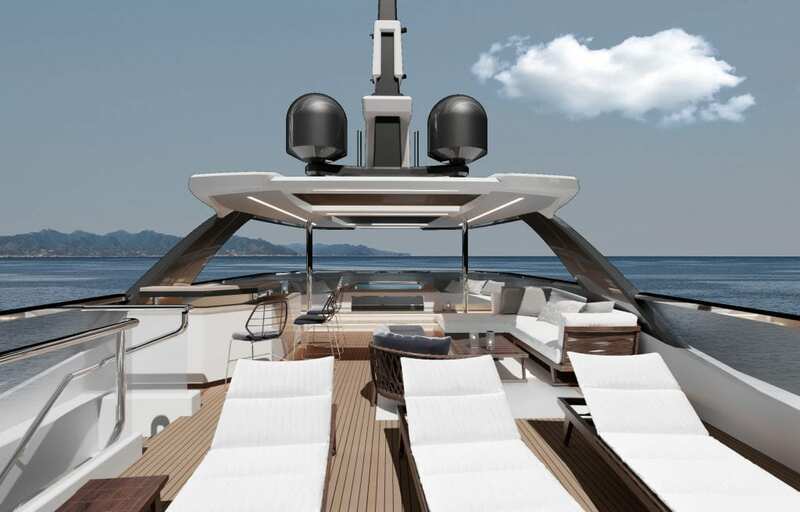 Everything is perfectly equipped and available to be on the water in full comfort and to enjoy the sea. 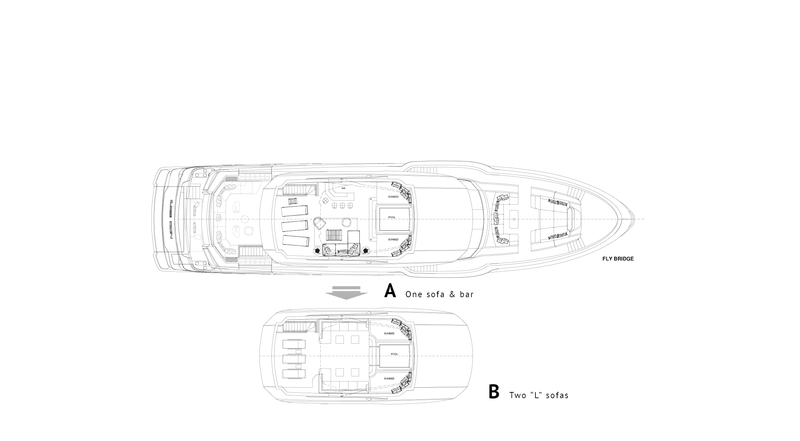 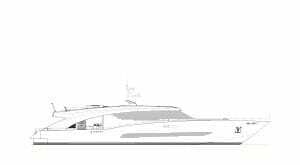 The maximum length of the tender is 6 meters (19 Ft) and in the Foredeck area we find further storage for tenders and toys.